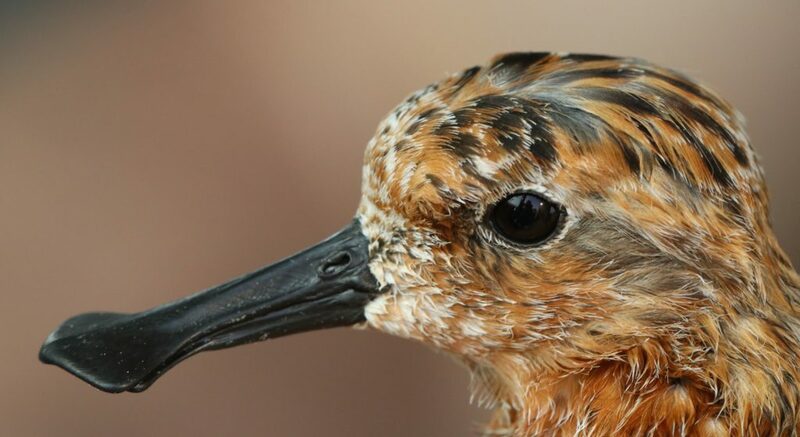 In October 2016, we fitted satellite transmitters to three Spoon-billed Sandpipers on their autumn moult and migration staging area in the south-west corner of the Yellow Sea; in Jiangsu province, China. The tags performed very well and tracked these birds south and west to their wintering areas in south China and Myanmar. The tags were not designed to remain on the birds permanently, and indeed all have now stopped giving signals; presumably having fallen off. But not before we learnt valuable new information about key sites used by these birds and new insights into their migration routes. The project team were so happy with the results of this first trial, that we wanted to go further and try to fill in some more pieces of the continental-scale jigsaw puzzle that is fully understanding the spoonies’ annual migration cycle. Our next window of opportunity was going to be back in Jiangsu, but in spring this time, seeking to understand how spoonies get from the Yellow Sea north to their arctic Russian breeding grounds, and indeed where they might breed. Currently we know where less than a quarter of the estimated world population breeds, so any new breeding areas we could identify would be very valuable. But, we knew that catching and tagging spoonies in spring in China was not going to be easy. Previous surveys had suggested the numbers present in Jiangsu on any one date in spring were maybe a quarter of the number present in autumn (and catching them in autumn was hardly easy!). And added to that, the potential for even larger numbers of other small waders to be present in spring – particularly Red-necked Stint and Dunlin in their tens of thousands – might make finding spoonies akin to finding a very small needle in a very large haystack. But if didn’t try we’d never know so the team assembled in late April in the port town of Yangkou and we set to work. Ten days later, after very little sleep and a concerted battle of wills trying to outwit our small feathered friends with a variety of trapping techniques, we had managed to catch two spoonies. Both were well through their moult into spring plumage and so both were fitted with a satellite tag. Given our uncertainty as to how possible it would be to catch any spoonies at this time of year here, we were extremely happy with this result. To get our two spoonies, we had also caught and colour-flagged over 900 waders of other species. Future sightings of these birds will help contribute our understanding of the migratory links between the Jiangsu coast and the rest of the East Asian-Australasian Flyway. We already have sightings of waders that we marked in Jiangsu in 2015 and 2016 from at least 10 other countries, from Russia to Australia. Spoon-billed Sandpiper, XT, resplendent in summer plumage. Photo by Guy Anderson. Our two new tagged spoonies, again named after their leg-flag codes; CH and XT, are giving good location signals close to where they we caught, and we expect them to start moving north within the next few weeks. For reasons of data sensitivity and bird safety, we won’t be able to allow automatic viewing of their locations this time, but we hope to provide regular updates on their progress. Ensuring the safety of these birds and any key sites that they might use, and ensuring that we can continue to use this research tool into the future have to be our priorities here. 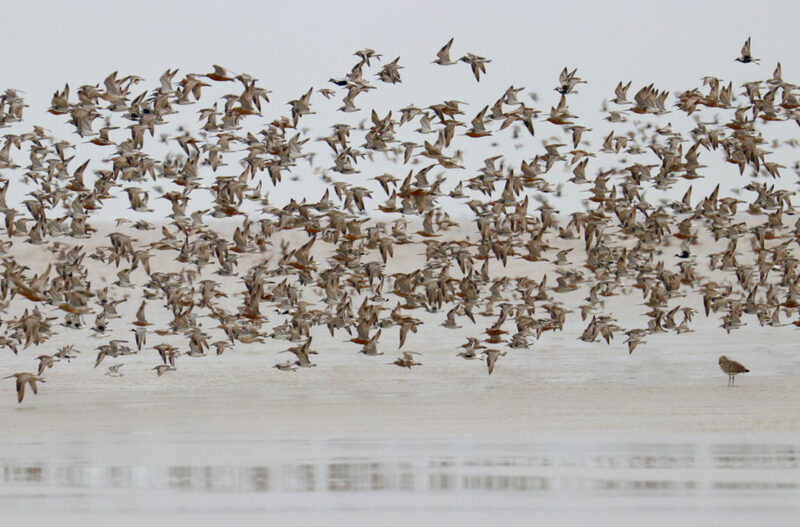 Wader flocks at Tiaozini mudflats, Jiangsu Province, China. Photo by Guy Anderson. On our last day of fieldwork in Jiangsu, we ventured out on to the mudflats at Tiaozini to look for Spoon-billed Sandpipers amongst the hordes of waders following the edge of the tide back and forth. Something between 50 and 100 thousand waders – Bar-tailed Godwits, Grey Plovers, Great Knot, Terek Sandpipers, Dunlin, Red-necked Stint and many others – wheeled around the skies in flashing, shimmering shoals, and carpeted the mud in dense roosting flocks. A stunning reminder of just how important the Jiangsu coast is for migrating waders – a vital pit-stop on this vast intercontinental flyway. Hiding in amongst the stints, a few spoonies revealed themselves by flashing a view of that bizarre beak. Tiny specks of life with thousands of miles to travel before they can nest. We wished them well, and hoped to see them again in the autumn. For CH and XT, we hope to hear from them much more regularly. CH and XT were caught and tagged as part of a continuing collaboration between Nanjing Normal University, SBS in China, BTO, RSPB, WWT and Microwave Telemetry Inc. Very exciting. Thanks for the update Guy. Hope the tags stay on and look forward to updates on these two spoonies progress. 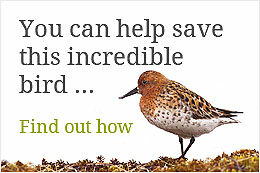 Wonderful little birds – do hope the numbers continue to grow step by step. Well done! These special little birds deserve your diligent attention. keep up the good work! He guys and all the team! Thank you; Well done and good luck to the birds and in return all the world population! How very exciting Guy. Well done you guys and of course you must not let us watch them all the way to Russia. Go Spoonies Go and have a successful breeding season..